Tulamben is internationally renowned for its dive sites and is prized for its easy diving and amazing biodiversity. The USS Liberty shipwreck must be one of the easiest wrecks to access in the world, and underwater creatures ranging from the smallest crustaceans, ghost pipefish, and pygmy seahorse to the largest fish like sharks and mola-mola sunfish abound. Tulamben is a great place for beginners, with a number of sites which are suitable for training dives, fun dives and underwater photography. This is known as one of the easiest wrecks to dive in the world. The USS Liberty is a shore dive and lies just 30 meters from the beach. The shallowest part of the wreck is at only 3 meters, allowing even snorkelers to get a glimpse. The wreck bottoms out at 30 meters. Surgeonfish greet you on your entry, and groups of bumphead parrotfish are often spotted, as is great barracuda and many beautiful and colorful nudibranchs. Tulamben Wall, also known as the Drop Off, is a good alternative site for your second dive after the USS Liberty. But it is more than that! Tulamben Wall has its own distinct characteristics making it equally interesting and beautiful to the Wreck. The Wall bottoms out at 60-70 meters, making it a favorite site among technical divers. As you peer below, you might see larger marine life like reef sharks and even hammerheads if you get really lucky. Along the wall, the colorful corals blend into a mosaic of beauty accented by colorful fish. The Drop Off also offers much to delight macro photographers! 2012-2013 Matahari Tulamben Resort started to create a new Divespot just in front of the resort. Without sponsoring from outside. 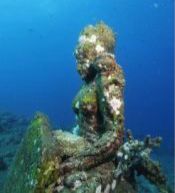 Depth 9 to 17 m. Beside of the figures of "Buddha", his mother, the goddess "Dewi Tara" and "Sleeping Ganesha" you will find different artifacts. In the meantime the place is not only popular for divers. A lot of fishes, net murane, cleaners and critters found a new home and like this place very much. Even Mola Mola and Eagle ray have been there already. 2016: "Suci Place" got new statues of Hindu Gods: "Baruna", "Brahma", "Wisnu", "Siwa", "Saraswati", "Sri", "Durga" and another "Ganesha". plus 1 "Temple". Starting to the north of Paradise Resort, the reef begins at a depth of only 3-4 meters. Here you can find an artificial reef project shaped as an airplane which dive guides refer to as Tulamben’s second wreck! Crustaceans and nudibranchs cover the area. It is an ideal spot for night dives as it is shallow and home to a variety of nightlife. Diving to the south, you will encounter a reef with patches of healthy and colorful soft and hard corals. If you want to see some Ribbon Eels, keep your eyes open! You should be able to spot a few among the corals. In the sandy area between Matahari Reef, Paradise Reef and on the way to the Liberty Wreck you will find very often in the shallow water blacktip sharks. About 15 minutes to the north by car from Tulamben, you will find this interesting and rarely-dived site. The coral reef is very healthy and home to many varieties of fishes. In 2003, one sea fan housed 8-10 pygmy seahorses. The BOGA Wreck came into the water at 2011. Because of mostly very strong current the wreck not yet has corals. Its laying from around 18 m to round about 40 m and not really recommanded for Open Water Divers. Simply said, this site is heaven for underwater macro enthusiasts. Harlequin shrimp and seahorses abound. Many macro objects can be found here, including several types of rare nudibranchs, mimic octopus and beautiful crabs and shrimp. The site can be accessed by traditional boat (jukung) from Tulamben or by car (a five minute drive to the south). There are several great dive spot around Bondalem Village which is around 1 hour away from Tulamben. The Government protect this area and the ocean with coral conservation, reef check and several underwater artefacts. The dive spots are great for macro or wide angel photographers. If you are lucky you can see for example Hairy Octopus, Stillinger, Frogfish, Doto sp., Janolus, Theracera, Ghost Pipefish, Sea Horses and Nembrota. To see our Dive Center there and pictures please follow the link: Matahari Dive Tulamben in BONDALEM We offer this trip daily on request from Tulamben and between the 2 dives we have lunch in a beach front Restaurant. There you can see how the people traditionally produce salt in two different ways and you can buy from the local people if you want.